This post is sponsored by Weruva. 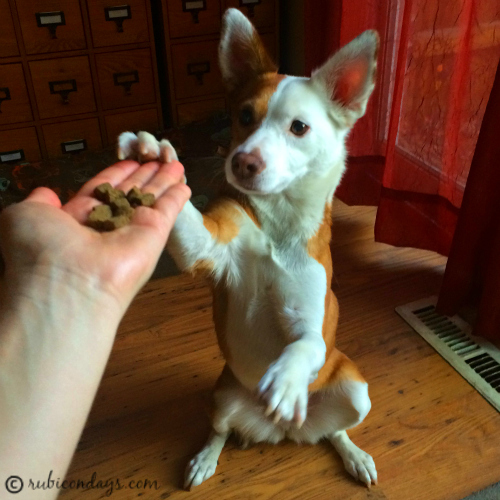 I am being compensated for helping spread the word about Weruva's new dry dog food, but Rubicon Days only shares information we feel is relevant to our readers. Weruva is not responsible for the content of this post. While there is some debate over whether dogs are carnivores or omnivores, I think most of us would agree that animal-based protein should be a major component of our dogs' diets. 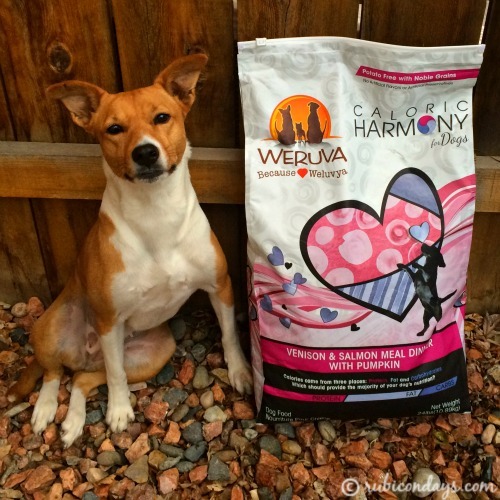 The main difference between the two lines of Weruva dry dog food is the percentage of animal-based protein: Caloric Harmony is higher at 77% of total protein and Caloric Melody with 66% is a lower price-point. Not only are they high in animal-based protein, but protein represents the highest source of calories. What I didn't realize was that even though the protein percentage may look high on a dog food label's guaranteed analysis, more calories are often coming from fat and carbohydrates than from protein. I spent nearly an hour on the phone with a representative from Weruva, and she taught me the formula for determining the carbohydrates in food, which is something not required to be listed in the guaranteed analysis. 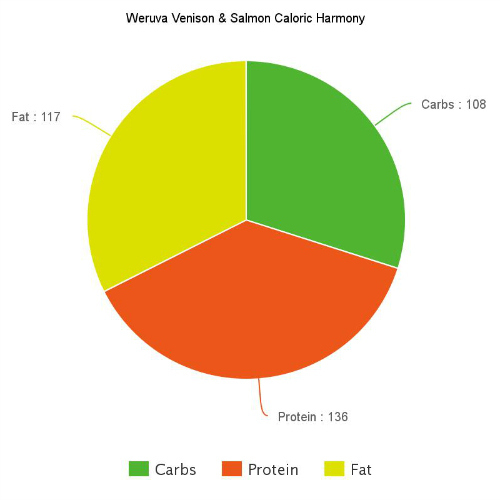 As you can see from the above pie chart, the calories in Weruva's Venison and Salmon Caloric Harmony - which The Ginger Sisters have been enjoying this month - are weighted between protein, fat and carbs, respectively, with the clear majority from protein. Looking at this reminds me of the dinner plate I fixed for Ruby and Boca at Thanksgiving - it's just intuitive that we want our dogs to have the most animal protein, followed by fat and carbohydrates. Fat is a tricky one because it is calorie-dense: fat contains 9 calories per gram as opposed to 4 calories per gram for protein and carbohydrates. In this way, foods that appear to be high in protein may still contain less protein calories than fat or carbohydrate calories. Using the formula I learned, I took a look at the caloric distribution of four other kibbles I had in the pantry. I was very surprised to see the differences in carbohydrate content and calorie weighting. Three of the kibbles were providing the most calories from fat, and one a staggering majority from carbs (it should be noted that these are all grain-free kibbles). One kibble has a distribution closer to that of Weruva's but its protein's caloric contribution still fell short. This information is definitely going to factor in to my kibble purchasing decisions in the future, and I am grateful to have another tool in my dog food nerd toolbox. No matter how conscientious the company is or how nutritionally balanced the food, it still comes down to whether or not our dogs will eat it. 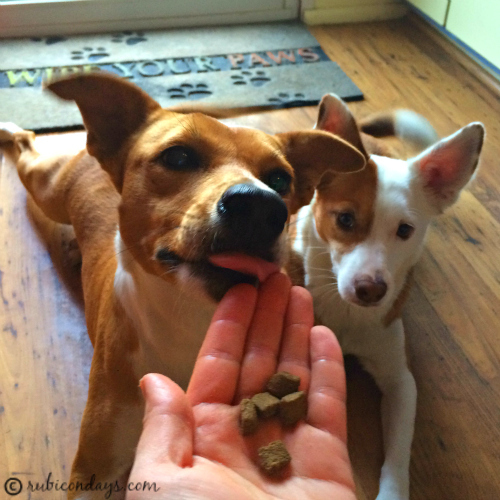 Even though The Ginger Sisters usually eat their kibble mixed with broth or goat milk and topped with freeze-dried raw, when we used the Venison and Salmon Caloric Harmony during a training session they were as excited about it as any high-value training treat. Weruva takes their ingredients seriously, with nothing sourced from China. Even their taurine - 99% of which is sourced from China - is sourced instead from Japan. The kibble is manufactured in Canada using the strictest standards. I know that I scrutinize labels more closely than I ever have, and it's important to me that all the ingredients are safely and ethically sourced. Weruva's venison and lamb are sourced from New Zealand, their Salmon from Norway and their fowl from North America. The Venison and Salmon formula is potato-free, contains oatmeal and barley and uses three varieties of carbohydrate (lentils, chickpeas and split peas) for their different binding properties. Other beneficial ingredients include pumpkin for digestion, chicken cartilage as a glucosamine source, and alfalfa and seaweed meal as prebiotics. I always want to see meat ingredients in the top five, and they represent four of the five (venison, venison meal, salmon meal and herring meal). I already felt capable of choosing the best foods for my dogs, but I loved learning even more about deciphering labels and discovering that there was a new way to evaluate my choices. Because I rotate foods I'm confident that The Ginger Sisters are receiving maximum benefits from their diverse meals, but I always want to be sure the components are the very best. Just as when I fixed them their own plates of holiday human food, it makes sense that meat should make up the majority, complemented by vegetables, grains, and healthy fats from plant or animal sources. 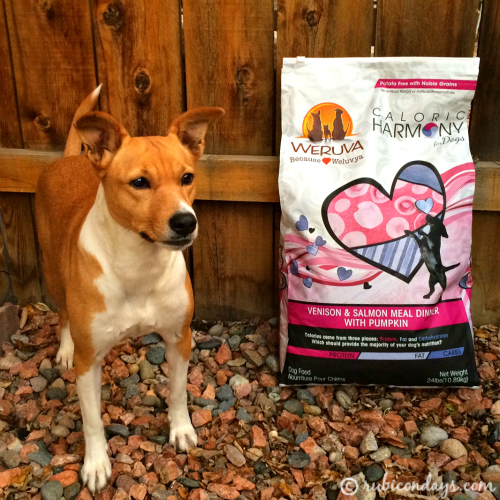 Weruva's new kibble line helps take the guesswork out of this balance and is one we will be adding to our regular rotation. Good to know about this food. Something to think about is the importance of fat in dogs diets as they use it differently then we do. I can hardly get enough into my performance dogs and look for ways to add more. Do you have an article you recommend about that, Linda? I supplement their food with sardine and coconut oil as well as goat milk, so they are getting added fat. Great review! I'm so excited about this kibble! I wish the pieces were a little smaller, otherwise I think it is one of the best we've tried. I was so excited to try it! I haven't seen at the Kriser's where I regularly shop, yet, but they carry their canned food so I'm hoping this will be available soon. Great information here - thanks for sharing! I've heard a lot about this brand, but have yet to try it. This is the first time I've seen a kibble from Weruva! It's very interesting that they sourced the taurine from Japan. I love how conscious they are about their ingredients and processes. 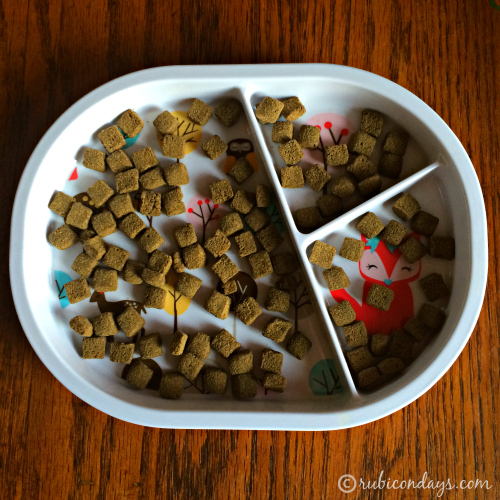 Sounds like a great kibble option! Mr. N has only had their canned food before.